LexisNexis® Investigative solutions leverage massive data and advanced analytics to help law enforcement solve crimes. Law enforcement agencies need instant access to comprehensive public records data and advanced analytics to generate quality investigative leads, produce actionable intelligence and drive informed decisions. LexisNexis® Risk Solutions investigative solutions help streamline criminal investigations and solve more crimes. They also facilitate cross-jurisdictional collaboration with powerful information sharing and data fusion tools, in support of specific law enforcement and homeland security missions. Instantly search detailed information using data from over 37 billion public records and 10,000 disparate sources. In minutes, confidently identify, confirm and authenticate identities, especially useful for individuals with common names. Batching allows processing of thousands of records at a time to quickly locate suspects, witnesses and fugitives. Securely and intelligently analyzes, filters and links billions of records to provide a more complete picture of an individual. By overlaying data onto a map, you can visualize complex relationships and see how entities are related and interconnected. Integrating state and regional-specific data sets with comprehensive public records facilitates entity resolution and cross-jurisdictional collaboration. Customizable alerts of changes in profile information can help law enforcement generate leads and respond faster to potential criminal activity. Quickly identify people and their addresses, relatives and business associates. Search a comprehensive database to find connections between people and their assets, addresses, relatives and business associates. Accurint® confirms the existence of assets, such as property, motor vehicles and FAA aircraft. With Accurint® you can process thousands of records at a time to locate suspects, witnesses and fugitives for criminal investigations. Accurint® shortens crime investigation time by giving you instant access to public records that would ordinarily take days to collect. Improve investigative processes with high-quality leads culled from critical information tailored to specific law enforcement challenges. Florida Dept. of Law Enforcement matches description with suspect in minutes. 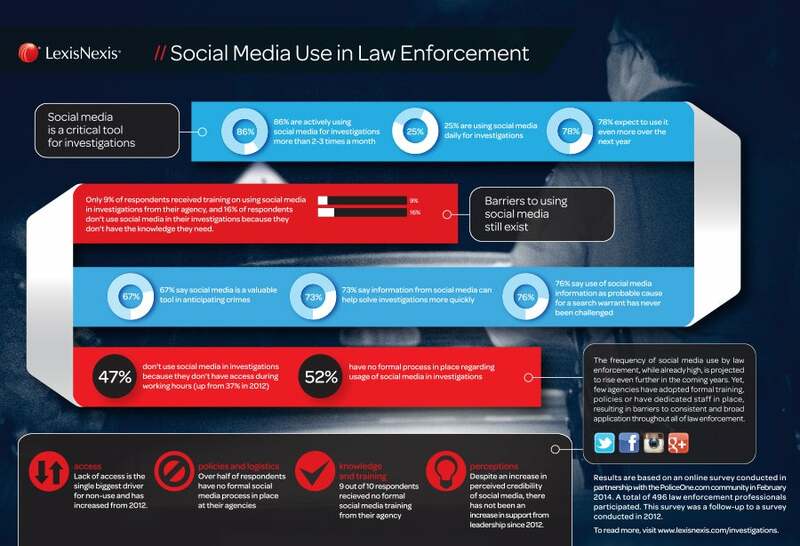 Understanding the role of social media in law enforcement investigations. Learn about the issues law enforcement executives face when using social media for investigations.